You are currently browsing articles tagged lisianthus. Cadbury purple is one of this years most fashionable wedding colour schemes. Start the look off with bridesmaid dresses in a stunning deep purple shade and dress flower girls in white with a wide purple sash. Complement the dresses with flowers in shades of purple, lilac and white. Or if you want to liven things up, pick a bright accent colour such as fuchsia pink, orange or lime, or a mix of all three. Can you guess what the sphere of flowers above are made from? they are compact balls of carnations. You might not have thought about carnations when you considered which flowers to choose for your wedding, but there are so many new funky new colours and varieties to choose from. A new range called moon series features a range of purple colours from pale lilac through to luscious deep purple. 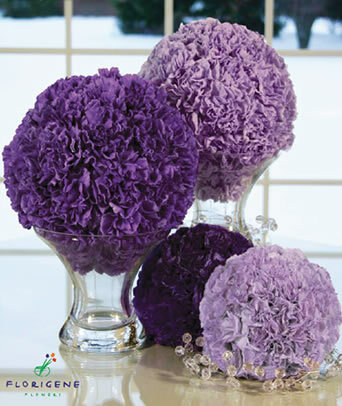 Carnations are very versatile and look great used en masse for pomanders or spheres of flowers. Purple is one of the rarer colour flowers but there are still plenty to choose from. These flowers are all available in purple: lisianthus, freesia, sweet pea, trachelium, aconitum, dahlia, hydrangea, gladioli, allium, delphinium, lilac, carnation, tulip, orchid and stock. 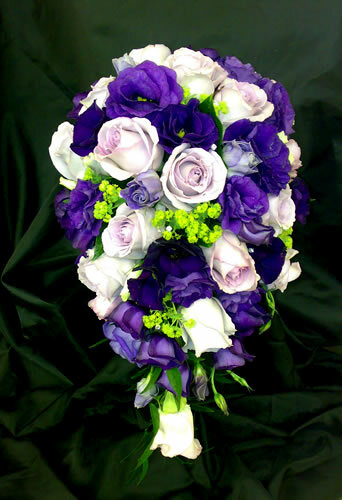 Roses aren’t available in purple but double lisianthus is a good substitute, it looks very similar to roses. There are also lots of lovely lilac roses available. Lilac and white flowers will help to soften the look of a deep purple colour scheme. Mix them with herbs like rosemary and sage to provide a lovely aromatic fragrance as well as adding an elegant informal garden look to your flowers. Flowering mint and fresh lavender also have lilac blooms and smell gorgeous. A touch of silver will help to lift this colour scheme, try adding silver grasses, and using silver candelabras with mirror on your tables. If you prefer a brighter colour scheme cerise pink will liven up your flowers. Or you could mix purple with cerise, orange and a touch of lime green for a really vibrant look. 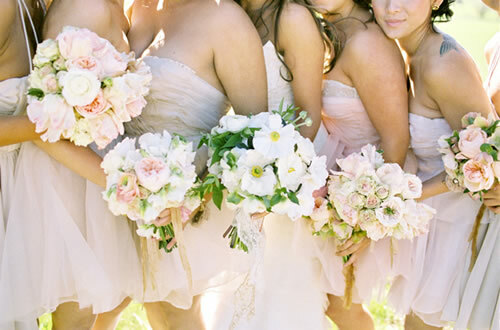 This colour palette will really stand out against purple dresses. For a rich and decadent colour scheme mix red with purple. A touch of black will also add to the glamour. Black glass candelabras overflowing with luxurious floral canopies would be fabulous, dripping with black beads or pearls. Once all the boxes of flowers arrive the fun starts. 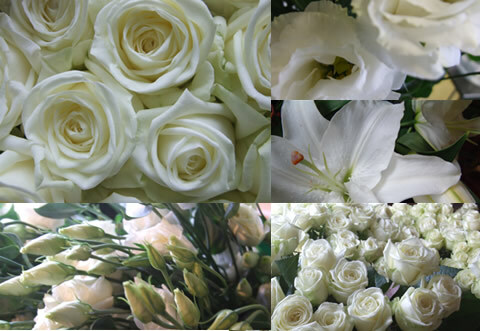 We have the flowers delivered midweek before the weekend of the wedding. This gives them a chance to have a good drink, as most flowers are sent from Holland without water and need to be hydrated immediately upon arrival. 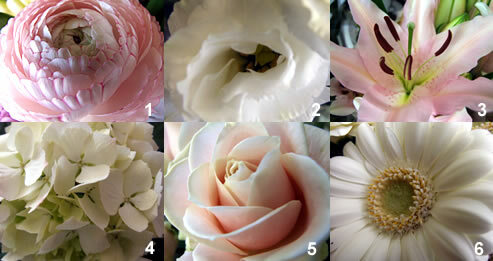 The flowers also need some time to open the perfect stage. 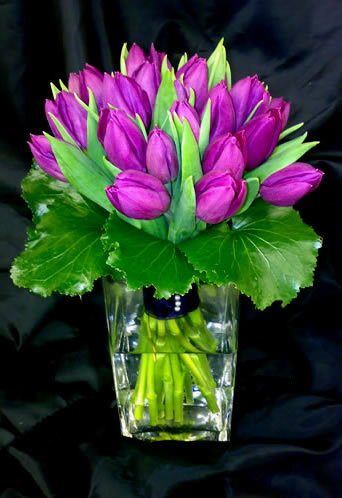 Some flowers like lilies require longer than others to open and often we will have those delivered a couple of days earlier than the rest of the flowers. With all the buckets neatly lined up, the flowers are carefully conditioned and put in water treated with flower food to feed them and encourage them to bloom. Some flowers like phalaenopsis orchids require extra special treatment. They are cut and submerged in water to hydrate the whole head. With buckets and buckets of beautiful flowers surrounding us we start to prepare the arrangements. 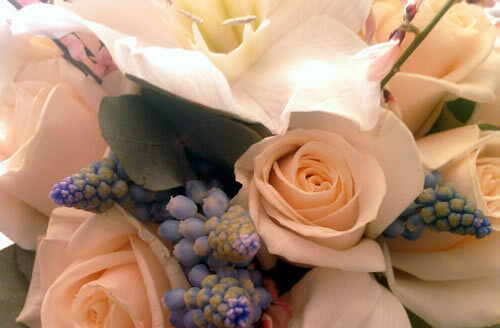 We first ‘green up’ any arrangements that will be in floral foam, such as table arrangements and pew ends. This in florist terms is preparing the base of foliage into containers with floral foam. Foliage is widely underrated as it helps create a perfect shape and provides a lovely background for flowers. It’s not free as frequently presumed and without it twice as many flowers are required. Once the flowers have had a couple of days in water they are fully hydrated and start to open. In the summer some flowers like roses have to be kept cool to prevent them from opening too much, whereas in winter it can be a struggle to get flowers to open in time for the wedding, warm water is often required to encourage flowers to open a little quicker. 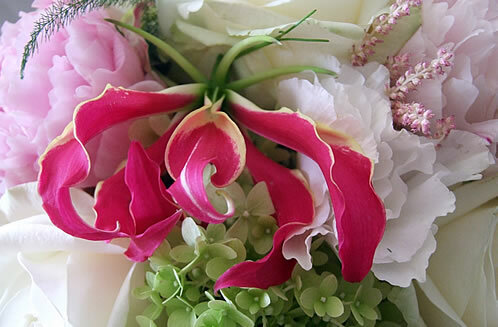 We always select the best and most perfectly shaped flowers for the bridal bouquets and put them to one side first. 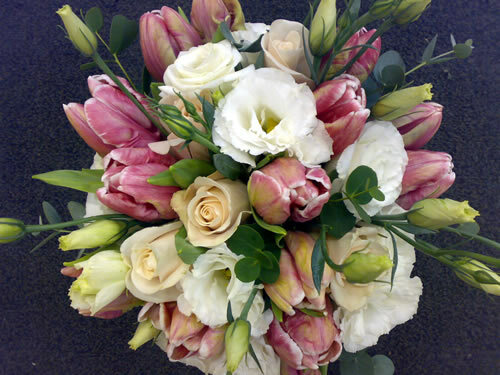 Apart from giving the bride the very best flowers to carry, the bridal bouquet will feature a lot in photographs for the wedding so we pay special attention to selecting them. The day before the wedding we can finally get going putting flowers in the arrangements we have greened up and make the rest of the designs. Any buttonholes or wired designs are made last to ensure they are in water as long as possible before they are wired and taped. We make the pew ends, pedestal arrangements, and table arrangements as these are in floral foam which retains water.